BIOHAZARD 7 resident evil INSIDE REPORT was included in the COMPLETE EDITION of the Japanese version of Resident Evil 7 Biohazard. It is only available officially in Japanese, and no official English translation has been announced. It is written by Toru Shiwasu, a novelist and editor for Dengeki PlayStation, in cooperation with e-Capcom, Capcom Japan's merchandise shop. The unofficial translation contained in this blog was written and edited by Alex Aniel (@cvxfreak). Takeuchi, having accepted the responsibility of developing Resident Evil 7, needed to organize its development team. Of course, this team would have to be the most suitable for realizing Takeuchi's desire to create the "greatest Resident Evil." From an outsider's viewpoint, Takeuchi appeared to be the "Executive Producer" for RE7's development, but to put it succinctly, he was really the "Project Leader." He was always in a position to decide the project's best direction, and at carefully timed check points, he would judge something that has been made as the "first user." Clearly he possessed a considerable amount of decision-making power, but at the same time Takeuchi was also responsible for the entire project. Continuing on, Takeuchi began his search for the members that would form the nucleus of the team. The first person Takeuchi called was Koshi Nakanishi. He had plenty of experience in game development, and with Capcom he did game design for Resident Evil 5 and was the Director for Resident Evil Revelations. Nakanishi's large physique contrasted with his ability to analyze information in tremendous detail, and above all, his open-mindedness. 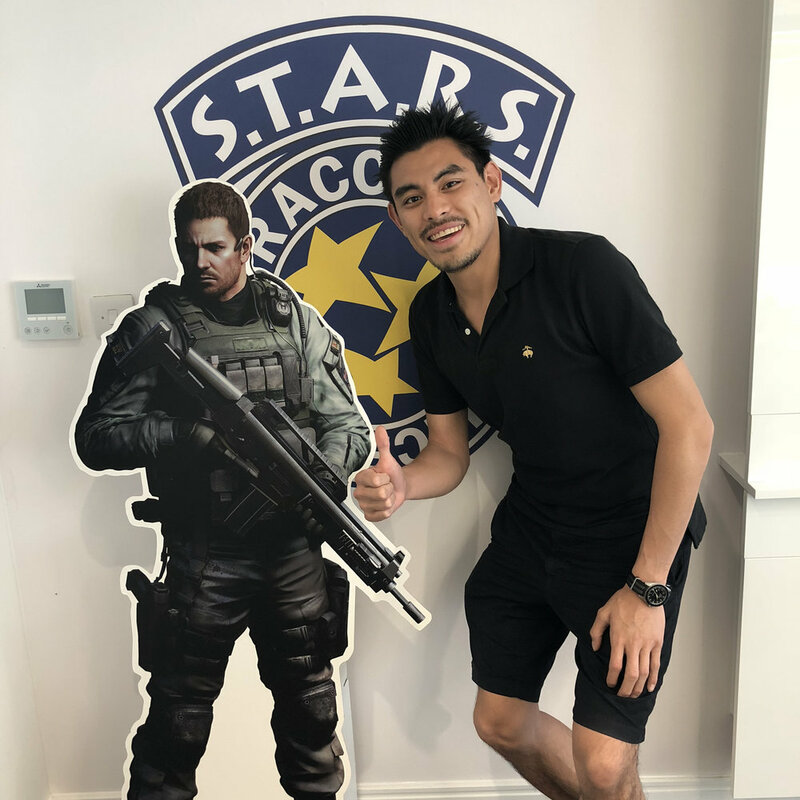 In order for Takeuchi to share his goal of making a "narrow and deep" Resident Evil, he decided that someone like Nakanishi needed to be part of the core team. Takeuchi briefed Nakanishi on what his thoughts were, and Nakanishi simply expressed his willingness to cooperate. That said, Nakanishi did not necessarily agree with the entirety of Takeuchi's vision of "narrow and deep." However, given the anticipated difficulties of RE7's development, Nakanishi agreed more with Takeuchi's greater concept of having to break from the past. So, he was convinced. "Let's try it." A long time ago, a Game Director was in charge of not only that game's quality, but managing staff, schedules and other matters as well. Meanwhile, the Producer managed the development budget, negotiated with the Marketing and Sales departments, and ensuring the project progressed smoothly. However, the scale of game development has increased considerably, and these days, a game is made to be sold globally, not just domestically. This has affected how roles are allocated. The Director was responsible for managing the schedule in creating the game, which was a Herculean task in and of itself; and for the Producer to take care of everything else, including budget and global expansion, was too much for one person. In order to make Resident Evil 7 into a Triple-A-caliber title, a "Project Manager" who specializes in managing a large number of staff and long-term development cycles was needed. Around the same time he approached Nakanishi, Takeuchi also contacted another individual. Fortunately, Kadono also comfortably accepted the offer. As an aside, Takeuchi had made Kadono into the number 2 member of the team; in other words, the Deputy Team Leader. Based on this HR decision, one could clearly understand where Takeuchi's priorities lie in terms of his management. Later on, I will devote a page to Kadono as a key person of the development team. Two people were selected as Producers of the team. One was Masachika Kawata. He is known as the Series Producer of Resident Evil, and was mentioned at the beginning of File 01. He would be tasked with primarily managing the development budget for RE7, and maximizing advertisement and sales. A game expected to sell millions of units and given a large budget would of course be expected to sell a proportionate number of copies. There was no person who could be responsible for such a feat other than Kawata, who has continued to look after the Resident Evil series for so long. And then there is another person whom Takeuchi invited directly in order to mainly handle worldwide marketing as a Promotion Producer: Tsuyoshi Kanda. He has worked at Capcom for 14 years, 6 of which were spent at Capcom USA. Kanda has always looked for ways to increase game sales worldwide. With plenty of experience selling games both domestically and internationally, Takeuchi felt Kanda was indispensable to the success of RE7. Later on, there will be more discussion about Kanda joining the team to handle marketing and sales as his main fields. "If a game isn't interesting, it is the fault of the Director. If the game doesn't meet its deadline, that is the fault of the Project Manger. If the game doesn't sell, it is the fault of the Producer. And then, the person with the final say over everything is the Executive Producer." Moreover, as mentioned in File 02, Takeuchi urgently sought to create an efficient game development environment and to foster the next generation of game developers. In particular, the development of RE7 would probably become the most comprehensive in Takeuchi's career as a game creator. Therefore, he wanted to train and entrust the future to as many people as possible. One way to try doing that was through development of a game engine. A game engine has a large influence on the development team members and environment. A considerable amount of time must be invested in order to research and fully harness the technical capabilities of the newest game hardware, which is highly advanced and never stops evolving. Simply put, an engine's responsibility is to allow that hardware to reach its full potential and be easily useable. Currently, many game manufacturers are utilizing engines that are user-friendly and great for general-use. However, Takeuchi felt that a general-use engine also used by other companies was not suitable for developing a product like RE7. There are many cases in which a highly general-use engine is not suitable for a product being developed with a very sharp focus. A special engine would be needed for RE7. It was fine for this engine not to be used by other companies. It would simply be enough for the engine to allow Capcom as a company and Resident Evil as an IP to continue fighting in the next generation. By the end of February 2014, a little under 10 people who could be considered as "core members" and as initial participants gathered together -- they were the central pillar of the organization. Staff would continue to be recruited, with priority placed on people who agreed with breaking from precedents in game development, as well those who resonated with the desire to make a Resident Evil that concentrated on horror. Many interviews were performed one right after the other. The search for people who had the necessary capabilities, and who could share ideals and goals with the organization would continue on.